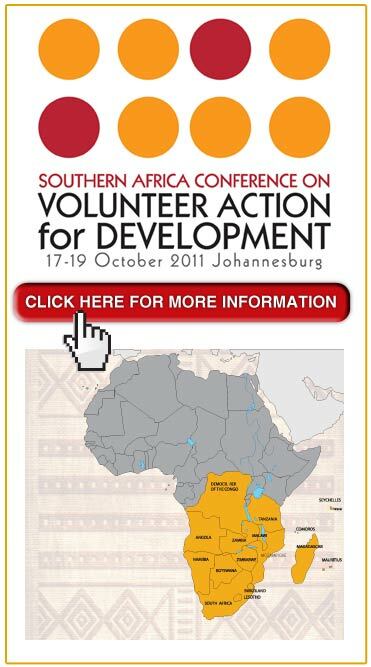 The Southern Africa Conference on Volunteer Action for Development was held from 17 to 19 October 2011 in Johannesburg, South Africa. The conference was an initiative of the United Nations Volunteers (UNV) programme in partnership with Volunteer and Service Enquiry Southern Africa (VOSESA) and the following partners: Canada World Youth, the European Commission, FirstRand Volunteers Programme, FK Norway, loveLife, Southern African Regional Universities Association and VSO-RAISA. The strong tradition and practice of volunteering in the region is generally not recognised or supported as a tool for development and peace. The conference was therefore convened to raise the profile of volunteer action as a tool for promoting people’s participation in southern African regional integration and development, including the achievement of the Millennium Development Goals (MDGs). Key outcomes of the conference were to strengthen the understanding about the contribution of volunteering in southern Africa towards the achievement of the MDGs and sustainable development; establish a larger number of southern African regional voluntary service programmes; and gain support from representatives of SADC member states for a UNV resolution on volunteering. 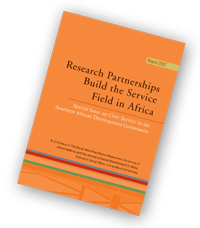 VOSESA's Five-Country Cross-National Study on Civic Service and Volunteering in SADC. 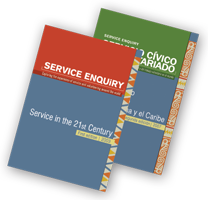 Service Enquiry, an online publication available free-of-charge that documents and analyses the experience of civic service and volunteerism in different parts of the world. VOSESA's analysis of the volunteering response to the 2008 Xenophobic Attacks in South Africa and its potential for social change. Copyright © 2013 VOSESA. All rights reserved.